The price of gas continued its precipitous decline during the past week, falling an average of 15¢ to settle at $2.40 per gallon. The figures are detailed in the weekly gas price survey from the Energy Information Administration, a branch of the Department of Energy. In some regions, the price of gas is so low it is closing in on the $2.00 per gallon level, and for a few lucky drivers across the Gulf Coast, the price is actually below that threshold for the first time in several years. This week’s price decline is so dramatic, it underscores the close bond between the price of consumer gas and the futures markets. Crude oil futures are down by half since the middle of the summer, when gas prices were averaging about $3.70 per gallon, nationwide. Since then, domestic crude oil, West Texas Intermediate, has fallen from a high near $105 per barrel down to close at $56.22 on Tuesday. WTI has been trading between $50 and $60 per barrel for the past two weeks, ever since it close under $60 on December 11. Brent Light Sweet Crude, the overseas benchmark, is also down substantially in the past six months, from $111 per barrel at the end of June to $60.68 on Tuesday. Brent has closed under $60 twice in the past ten days. 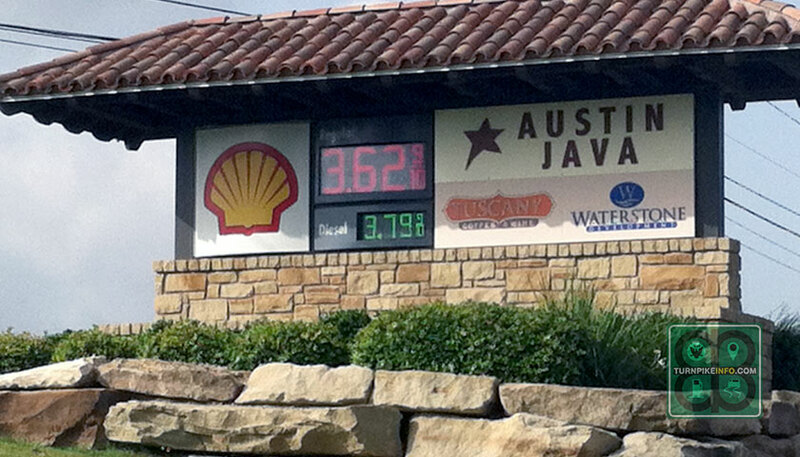 At left: The price of gasoline has fallen so dramatically, the cost is below $2.00 per gallon in some areas of the United States, including at this station in Round Rock, Texas, near the Dell Campus, which is adjacent to the Texas 45 toll road. Meanwhile, the accompanying price chart from the E.I.A. displays the dramatic rise and fall of gas prices during 2014. Photo: Eric Scallion. Chart and data: E.I.A. The question of how low prices will go is a point of contention among energy analysts, but the general mood is that the current glut in oil will likely last well into 2015. A report on Bloomberg news this morning details the trio of issues that have converged to impel the biggest yearly drop in oil prices since the Great Recession began in 2008. Those factors are high output by the United States, where the shale boom has help production rise to its highest levels in 30 years, continued high output by OPEC nations, and a slowing global economy that will continue to reduce worldwide demand in the coming months. While the U.S. economy is growing at a fairly good pace – the Commerce Department reported gross domestic product rose at an annualized 5 percent rate during the third quarter – market watchers from Europe to the U.S. agree the rise in American demand for gas is not enough to offset the lower demand overseas. While much of what happens in energy markets may seem esoteric to the average consumer, the corollary between crude and retail gasoline is unmistakable. Particularly in the face of high domestic production, drivers are not likely to see gasoline prices reversing course any time soon. Brent and WTI futures for February delivery are not any higher than the January contracts, which are influencing the price of gasoline today. That price of gas has fallen $1.30 in the past six months, but the price of diesel has also come down substantially in the past six months, although the declines have not been quite as dramatic as retail gas. 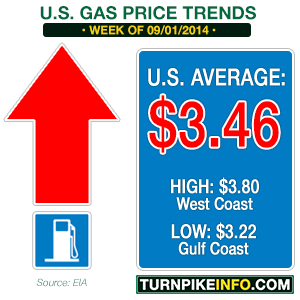 Diesel prices, on average, fell 14¢ per gallon last week to settle at $3.28 per gallon. As with regular automotive fuels, diesel prices vary region by region, but the disparity from one section of the nation to the next is not as dramatic as with unleaded gas. For instance, the lowest prices for gasoline are found along the Gulf Coast, where the average consumer is paying about $2.18 per gallon. The highest average price, by survey region, is the West Coast, where prices are still about $2.70 per gallon. That is a range of 52¢. On the other hand, diesel’s highest prices are presently found on the East Coast, where the cost is $3.43 per gallon in the New England states, higher than California, where the price averages $3.41. The lowest cost is across the Gulf Coast, where prices for diesel are about $3.18. That puts the range for diesel at only 33¢; the fact diesel is more costly than unleaded gas also means that, mathematically, the cost of the fuel is more consistent from region to region. 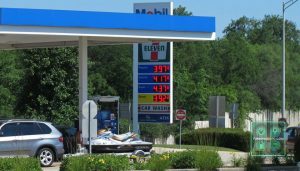 The cost of a gallon of gasoline fell another nickel across the U.S. last week, this according to the latest gas price survey from the U.S. Energy Information Administration. The weekly E.I.A. survey shows the average U.S. cost for a gallon of regular unleaded is now only $2.89, with prices far lower in some regions. For the Gulf Coast, the cheap spot of the nation, a gallon of gas will only set you back $2.67, on average. Prices continued to fall between three and six cents per gallon across every survey region in the past seven days. Even in California, where prices remained above $4.00 per gallon most of the summer, prices fell nearly 7¢ in the past week to settle at $3.15, nearly $1.00 less than just a few months ago. For many drivers, the retail price declines have been exceptionally beneficial on the wallet, the construction of the last leg of the Keystone XL pipeline has the potential to add to that benefit. A tale of two stations? 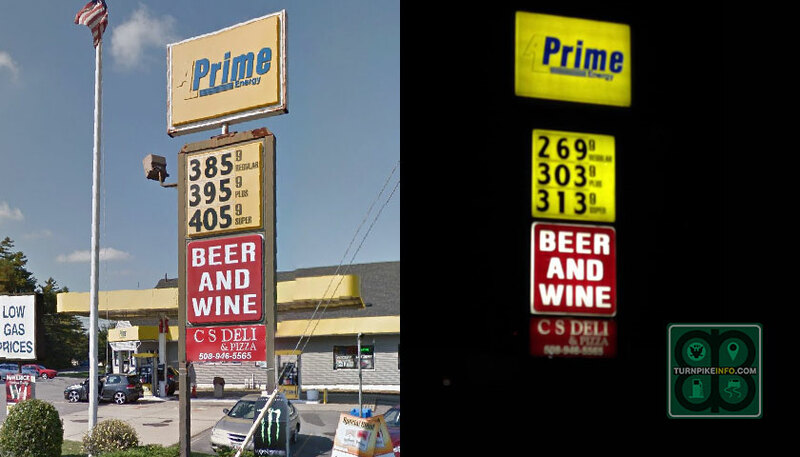 These pictures of a Prime Energy station in Middleborough, Massachusetts, from Google (left) and from Turnpikeinfo.com user Owen Miller (right) show how gas prices have swung wildly in the U.S. in the past two years. No price decline in recent years has been as dramatic as the one experienced since the end of June. Crude oil is down 30% and unleaded is down more than 80¢. Crude oil prices have continued to plummet in the wake of slowing global demand and an increase in production from the United States. Furthermore, nations belonging to the OPEC cartel have been unable to influence production that would slow the decline in foreign crude prices, and as a result, both domestic and overseas crude remain at multi-year lows. West Texas Intermediate, the domestic benchmark, is at its lowest point since the start of 2009. Meanwhile, new geopolitical risks that might otherwise push up crude prices are likely to only bump futures contracts from time to time, according to a pair of analysts who spoke to Bloomberg last week. Dan Dicker, the senior contributor to Oilprice.com, said he believes the current market will trap crude prices in a narrow range. Scott Bauer, from Trading Advantage, said he believes traders will likely sell contracts that get up to $81 per barrel and reacquire contracts when they fall to $76. As of Tuesday morning, WTI is trading under $75, while Brent Light Sweet Crude is hovering just above $78 per barrel. The good news for the American driver also translates to good news for the American hauler. Truckers have continued to enjoy diesel price declines through the summer and into the fall. The average price of a gallon of diesel fell last week to $3.66. Although there was a slight price bump in the West Coast region, all other regions enjoyed a week-over-week price decline. The Midwestern states, where diesel prices soared by double digits last week, watched a leveling of prices. The other region hit by last week’s power price surge was the Rocky Mountain states, where prices fell three cents this week. Overall, however, diesel prices remain anywhere from 70 to 80 cents per gallon higher than unleaded gas. 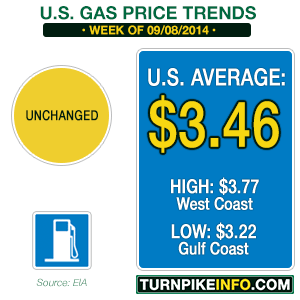 Gas prices officially fell below the crucial $3.00 level in the latest EIA price survey. However, prices in many regions have been below that threshold for a few weeks. 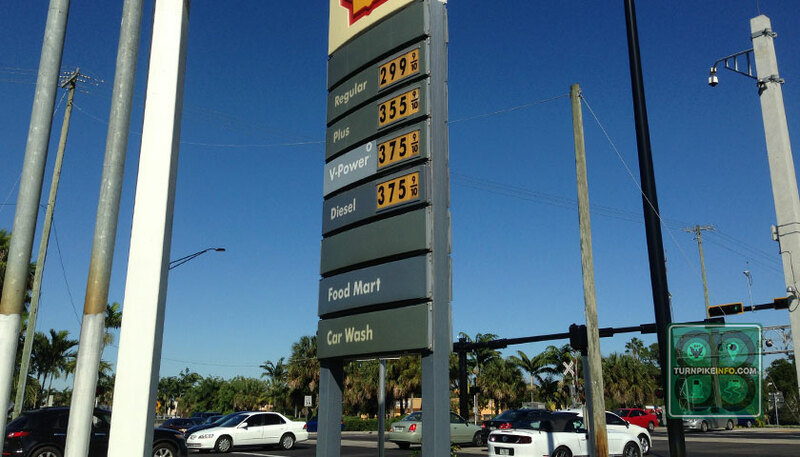 In some urban areas, like at the South Florida gas station pictured below, that price point is just being seen. The U.S. average price for a gallon of gas is now officially below the $3.00 per gallon threshold, according to the latest pricing survey from the U.S. Energy Information Administration. The E.I.A. reports shows over half of all survey regions now average under that same benchmark. The highest price for gas is still being paid on the West Coast of the U.S.; however, even in that survey district, the price of a gallon of regular unleaded is down to $3.24. Remove expensive California from the formula, and the West Coast average is, itself, only $3.13, in line with other regions where the price of gas remains above the $3.00 mark, including New England and the Rocky Mountain states. The plunge in retail gas prices tied to the steep decline in recent weeks of the price of crude oil. Both domestic crude, West Texas Intermedia, and the overseas benchmark, Brent Light Sweet Crude, are down significantly from their early-summer highs. WTI is even trading below $80 per barrel, the first time it has been that low in 30 months, according to CNBC. In the meantime, some hedge fund managers are calling for short-term prices to remain low and move lower. Andy Lipow of Lipow Oil Associates told CNBC earlier today he expects the average gas price in the U.S. to be $2.80 by the Thanksgiving holiday. That would certainly be great news for drivers hitting the road during that critical travel weekend. If that prediction holds true, that price point would also be 91¢ less than the peak price earlier this year. The U.S. average topped off at 3.71 at the end of April. Truckers and other drivers of diesel-powered vehicles are experiencing a break at the pump, too; however, the price declines for diesel have not been as steep as those for their gasoline-powered counterparts. Diesel fell only about a penny per gallon during the past week, much smaller than the six-cent decline for regular unleaded gas. Even so, the price of gas for all vehicles, whether gasoline or diesel, is down significantly from a year ago. For regular gas, the cost of a gallon of fuel is now 27¢ less than last year; diesel is down over 23¢ from this period in 2013. The nationwide average price for a gallon of regular unleaded fell to $3.06 during the past week, according to the U.S. Energy Information Administration. That figure is down six cents from the previous week. As with all weekly surveys, this week’s E.I.A. 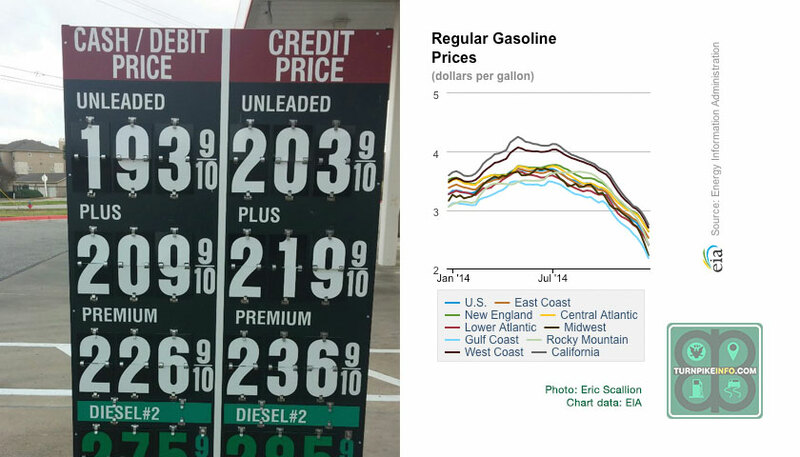 report shows some regions enjoyed a larger decline, particularly the West Coast, where prices fell 10¢ per gallon to settle at a regional average of $3.32. The cheapest regional prices were found across the Gulf Coast region, once again, where the average retail cost for gas is now only $2.83 per gallon. Part of the reason for the decline in prices is the high output of U.S. shale production and a slowing global demand. The price of crude oil futures, particularly West Texas Intermediate, has fallen dramatically since its summer highs. Price have been trading in a narrow range for days, flirting with the potential of falling below the $80 per barrel threshold. That has been good news for drivers. The cost of gas has fallen so much in the past several weeks, the cost of fuel is now anywhere from 17¢ to 30¢ per gallon cheaper than at this time last year, depending on the survey region. That good news extends to truckers, too, who are also paying substantially less this year for diesel fuel. Overall, the price of diesel has not fallen as dramatically as gas prices in recent weeks; however, the year-over-year price difference of diesel fuels is identical to the price of gasoline. For both types of fuel, the U.S. average price is 24¢ cheaper than 2013’s rate. There are indications retail prices could push even lower, especially if crude oil prices continue their free-fall. In fact, overseas crude oil prices, which have also fallen substantially, may not have the power to reverse course with the same gusto as in previous years. The reason is a decline in the pricing power member nations of OPEC, the Organization of Petroleum Exporting Countries. The reason comes back to U.S. shale production, according to Jeff Currie of Goldman Sachs. Mr. Currie made his comments on CNBC, telling reporters that the United States has more power to influence price swings. The cost of a gallon of unleaded gas fell about two cents last week to settle at $3.68, according to the latest survey by the U.S. Energy Information Administration. The nationwide average gas price was lead by a moderate decline in gas prices across the Midwest, where the average cost of fuel dropped almost 6¢ per gallon. Retail gas pricing seemed to follow a decline in the price of crude oil, particularly West Texas Intermediate, although the fluctuations in both crude oil and gas prices, themselves, happened within such a close time span there is not likely a direct corollary. Crude peaked near the last week of June, but it has been coming down since. The cost of WTI on the New York Mercantile Exchange (NYMEX) has fallen below $104 per barrel, and it has been flirting with the $103 level. Prices peaked at $106.77 per barrel June 25. For the rest of the country, the cost of gas took a summer dip or moved higher, depending upon where you live. 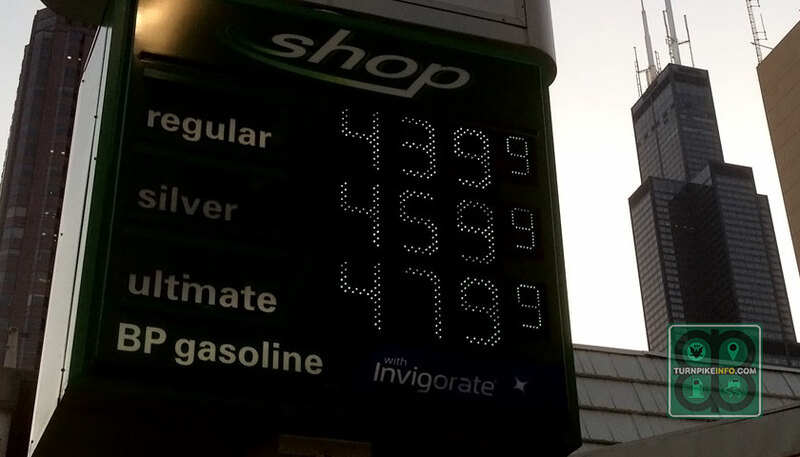 For drivers on the West Coast, the cost of gas pushed up about a penny per gallon. The same happened across the Rocky Mountain region. New England drivers are paying about the same or slightly more this week than last, according to the E.I.A. survey. The Lower Atlantic and Gulf Coast states enjoyed a dip in pricing of 3¢ and 2¢ per gallon, respectively. The Central Atlantic states, which includes the Carolinas, Viriginia and Maryland, prices dipped by only about a penny. In fact, the further north one traveled along the Atlantic Coast, the less likely gas prices were to have declined from last week’s retail pricing. Above: The price of gas on July 4, inside Chicago’s famous Loop. Below: Gas prices at the Hinsdale Oasis on the Tri-State Tollway the same day. While higher than the Midwest regional average, regular unleaded was about 31¢ per gallon less than downtown Chicago. 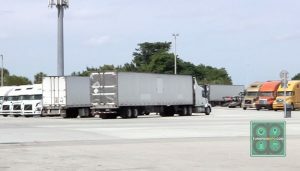 However, prices in some metropolitan areas were mixed or barely moved at all, according to spot surveys done by TurnpikeInfo.com during a highway tour the first week of July. For instance, prices in downtown Chicago remained the same from one survey period to the next, even though the price of gas in the metropolitan area declined by about 8¢ per gallon, according to the E.I.A. While we toured the Illinois toll roads, the cost of gasoline at a local station at on Congress Avenue, inside Chicago’s Loop, was $4.28 per gallon, well above the $3.87 average for the city. Meanwhile, along the Tri-State Tollway, at the Hinsdale Oasis, the Illinois equivalent of a service plaza, the price of gas was $3.97 per gallon for regular unleaded. The Hinsdale Oasis is still within the Chicago metro area. That kind of pricing disparity is not uncommon across various metropolitan areas and smaller cities, whether in the Midwest or elsewhere. Observations made by TurnpikeInfo.com during the past 18 months show fuel prices in some cities across South Florida can range by as much as 30¢ per gallon over just two to three miles of real estate. The recent tour of the Midwest toll roads revealed the range to be approximately the same in Illinois. Prices in both regions tended to be much higher near urban cores and lower in the suburban areas. 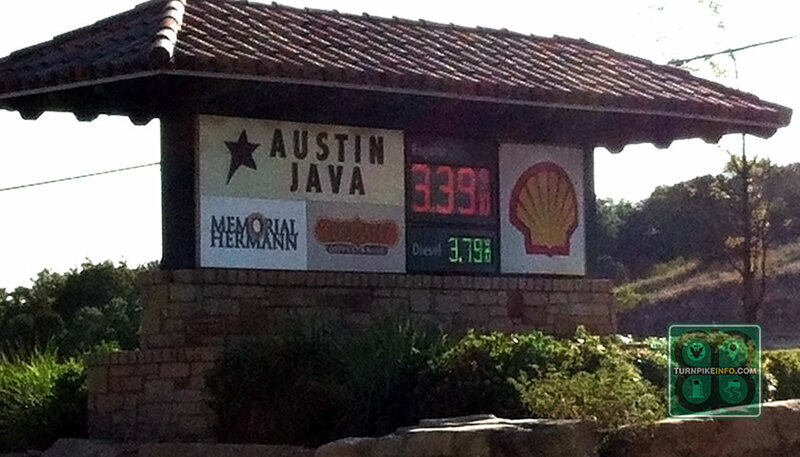 Gas prices adjacent to the Capital of Texas Highway, a toll road that connects Austin with its northern suburbs. Prices on June 30 were about 5% higher than the Gulf Coast average. Photo: Kristen Scallion. The urban-versus-suburban price differences are not as dramatic in Texas, where the cost of gas along the Capital of Texas Highway, a Texas toll road, can run higher than the state average. 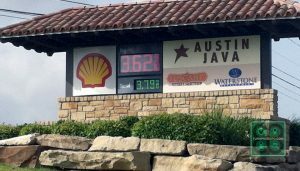 Drivers near Austin were paying about $3.62 per gallon for regular unleaded on June, which was about 14¢ per gallon higher than the Gulf Coast average for that day. About one week later, in outlying Round Rock, the home of one of the Dell Computer campuses, the cost of fuel was about $3.45 per gallon the morning of July 8. Drivers in that suburban city were enjoying a fuel cost about a penny below the regional average, underscoring the variance between prices in the urban core and those in suburban and rural areas. Regardless of the region or state, surveys by TurnpikeInfo.com and its spotters show there is nearly always a significant disparity. Regardless of urban pricing, the cost paid by drivers on the highway and the toll roads is what matters most, when traveling between cities. The E.I.A. 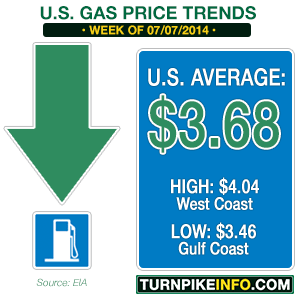 price point for the Midwest, for the July 7 survey, shows the Midwest regional average gas price is $3.61 per gallon. During our tour, the price of gas in Illinois was about 11¢ per gallon higher, while most stations and truck stops along the roadways in Ohio and Indiana were charging between $3.52 and $3.65 per gallon. The Midwest regional average, as reported by the E.I.A. July 7, is $3.61 per gallon. The cost of a gallon of diesel fuel dipped by about a penny per gallon, at least on a nationwide basis. The nationwide average cost for diesel is now $3.91. For most of the East Coast, however, the cost was relatively flat. In the Rocky Mountain States and the Gulf Coast, the cost of diesel declined enough to be noticeable. In California, truckers got no relief as the price of diesel remained at an average of $4.14 per gallon. 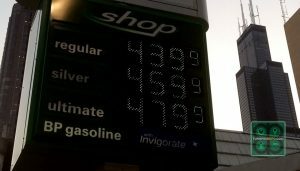 Across much of the remaining West Coast, however, the price of diesel did drip about a penny per gallon. None of the past week’s decline in gas prices does anything to change the fact that 2014’s summer driving season is more expensive than 2013. For some areas, the change is scarcely noticeable, but such minuscule price moves are confined to the Rocky Mountain region. For most of the rest of America’s drivers, the cost of gas is between 16¢ and 22¢ higher than it was last year. Averaging a 19¢ per gallon price differential, that means the cost of the average fill-up, for a 15-gallon fuel tank, will be about $2.85 more than last year. However, the difference for truckers is significant, given the size of fuel tanks on most tractor-trailer rigs. While year over year diesel prices up less than retail gasoline, the price is still about 9¢ per gallon higher than at this time last year. That means a truck with a 300-gallon fuel capacity is going to cost $27 to refuel. Most rigs get between 4 and 8 miles of travel for each gallon of fuel, according to Wikipedia.org. The price of gas reversed course during the past week as the 2¢ gains that were reported in the June 2 government fuel price survey were wiped out this week. The pricing news is journaled in the latest data from the U.S. Energy Information Administration. This week’s E.I.A. report shows the price of gas did a precise about-face, at least on a national level, while prices declined more so in many regions. The Rocky Mountain States and the broader West Coast region, which does not include California, were the only survey areas where prices stagnated. At the national level, the price of gas now averages about $3.67 for a gallon of regular unleaded, exactly where it was two weeks ago. The biggest price declines were found along the East Coast, particularly in the Lower Atlantic States, where prices were down over two cents, on average, from last week. Along the Gulf Coast and in the Midwest, prices were also off by about two pennies, but for the Midwest, as usual, the average price data are distorted by substantial swings in fuel costs in certain states. For instance, in Ohio, which has endured substantial price volatility, the average gallon of gas costs 12¢ less this week. At the city level, the numbers are even more telling. For Cleveland, the price of gas dropped about 12¢, much like its home state of Ohio, but two states over, in Illinois, the price of gas in Chicago only fell about 4¢ per gallon. Diesel prices are at a five-month low after the national average fell below $3.90 per gallon this week. For the first time since January, the national average price of diesel fuel dropped below $3.90 per gallon, according to this week’s E.I.A. report. The price of diesel slipped downward by almost 3¢ per gallon during the past week, officially settling at $3.89. That price point is the best figure truckers and other diesel drivers have seen since the end of January, when prices began a continue climb to well over $4.00 per gallon. While this week’s news is good for truckers, prices in New England, the Central Atlantic region and in California remain well above $4.00 per gallon. Only the drivers in the Gulf Coast states are enjoying relatively low diesel prices, as the average from Alabama through Louisiana is now about $3.77 per gallon. While this week’s gas price survey is the best report from the EIA in about a month, the news is not likely to persist in drivers’ favor. The reason is the all-important crude oil futures index, West Texas Intermediate, which has been trading in record territory in this year. In fact, after-hours trades on Monday, June 9, were the their highest level of the year, and the highest level seen in three years. Investors trading on the New York Mercantile Exchange had bid the WTI up to about $104.50 per barrel as of 8:30 p.m. Monday night. That would place the futures index, at least on the NYMEX, within range of its three-year high, a portent of what could face consumers at the retail level come July. Bloomberg News is citing a number of factors for the increase in the futures price, including tightening supplies of crude oil in the United States, which is the world’s largest oil market. Other factors included speculation in the wake of last week’s favorable unemployment report, which leads investors to believe more people will be on the road for business and pleasure in the coming weeks. The likelihood of increased demand during the summer travel season, coupled with renewed demand from China, has investors eyeballing the possibility of tighter supplies amid increased consumer need. Meanwhile, Bloomberg reported renewed unrest in Libya, where political discord during the past three years has severely disrupted production. Output is being reported at only about 180,000 barrels of oil per day, compared with about 1.3-million per day one year ago.